The unofficial kick-off to the all-important travel team season took place Saturday and Sunday at the CPS Sportsplex in Apopka as Source Hoops joined forces with Hoop Exchange to put on the 2018 Travel Team Jamboree. An invitational, top Florida teams in the 17U, 16U, and 15U age group categories were brought to compete in a high intensity atmosphere to get a gauge on what they do well and what they need to work on before hitting the road in April for the live period in front of college coaches. This team played well last year on the Adidas Gauntlet 16U circuit and this last go-around should attract a lot of accolades and college coaches from all levels. On Saturday, we came away most impressed with the guard tandem of Xavier Johnson and Darrin Green. Johnson, a 6’0 junior out of Virginia whose father is on the UCF staff and will be moving to Florida after the end of the school year there, fit in well with his new teammates. He got them good looks in transition, was very active defensively to force turnovers, and was smart with his shot vs. pass decisions. Green, a 6’4 wing out of Tampa Wharton, has a feathery jumper that is quite consistent. Though most dangerous in catch-and-shoot situations, Green has improved both his ability to rise up and connect from mid-range as well as challenge bigs at the basket and score. This group was not at full strength as Tre Mann sat out the second of two games with soreness in his knee and 6’8 junior C.J. Walker was out of town visiting family. Still, this EYBL program has enough talent to continue its winning ways on Nike’s circuit. Marsei Poston, a 6’3 wing from Jacksonville Potter’s House is an aggressive scorer, particularly when given the chance to challenge his defender off the dribble. He is capable of finishing well above the rim and will also knock down open shots from beyond the arc. Another explosive athlete for E1T1 is Johnnie Williams IV out of Sarasota Booker. The 6’4 junior wowed observers with a put-back dunk out of nowhere and his ability to play bigger than his size will be of big importance to the program as it attempts to make it to the Peach Jam. The Pink and Black are back with a group that should allow Team Breakdown to continue to be one of the top teams in the Under Armor Association. While the group may not have as dynamic a scorer as Anfernee Simons this time around, the group may be deeper in terms of having multiple scoring options. 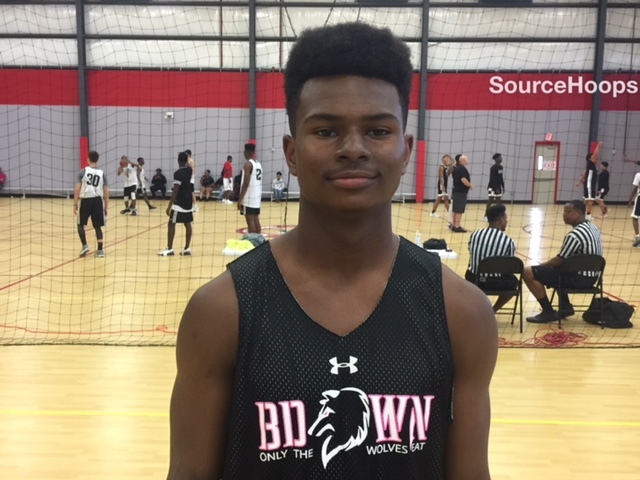 Jamal Mashburn, Jr. (pictured), a 6’0 sophomore will make the jump from playing 15U last year to 17U this time around. He is a potentially potent scorer every time he steps on the floor. Kai Jones, a 6’10 junior forward from Orlando Christian Prep, will see a lot of time inside. A bit on the lean side, his length and leap will allow him to challenge shots and get to rebounds before being out-muscled. Jones can also step out and make shots, allowing more room for Breakdown’s perimeter players to attack the basket. Don’t be surprised if this is one of the better teams on the Adidas Gauntlet Gold circuit this spring. This group of versatile scorers and defenders should be a tough out every time they play. Luke Anderson, a 6’8 forward from Lakeland, continues to be one of the more productive members of the 2019 Class. He rebounds well in traffic at both ends, can step out and make perimeter shots, has the ability to put the ball on the floor and challenge the defense and is a solid ball-handler and passer. Cyrus Largie, a 6’4 guard out of Hialeah Mater Academy, made the game look simple at times on Saturday. He made some slick passes for scores, knocked down open shots, and finished thru contact at the basket. This group looked cohesive and well-coordinated this early in the travel season. Clearly, the team’s diverse skill set has meshed early and the chemistry is solid. Taylor Trudeau, a 6’3 junior from Mount Dora Christian, put on a three point shooting display in the contest we watched. He makes those off the dribble just as easily as off the catch. Johnny Brown, a 6’8 junior from Daytona Beach Maitland, may have been the biggest surprise of the day. He swished a three early, put the ball on the floor from the high post and scored, gathered rebounds and quickly got the ball ahead in transition. He ability to be effective both inside and outside of the paint should get college coaches’ attention. We highlighted this group last week in our Travel Team Profile so it was good to see them in action. This group has a never give up attitude as they came back to win in the closing seconds of their first contest of the day. On the perimeter, 6’5 junior Ben Lubarski from Palm Beach Gardens Benjamin led the way. After getting off to a slow start, he ended up knocking down five of seven jumpers from 18 feet or farther out. He’s strong and handles the ball well enough to take smaller defenders off the dribble to the basket. Only a sophomore, 6’8 Giancarlo Rosario more than held his own on the glass and was always available as an outlet at the high post. Rosario also scores well enough inside that defenses have to play him honestly, giving room to Ball4Lyfe’s jump shooters. A roster full of lengthy athletes that like to get out and run, force turnovers, and play above the rim live up to the team’s name of Showtime Ballers. Elie Cadet, a 6’5 senior out of Oakland Park Northeast, has some serious hang time which allows him to make some difficult shots in the paint. He outrebounds most bigger players because he gets off the court so fast and is usually the first to the ball. As one of the guys that will run the offense, 6’0 junior Jalen Nesmith showed speed and creativity with the basketball. He played last season in NY but has family in Jacksonville. Nesmith made good decisions coming off ball-screens, finding the screener for easy baskets or knocking down perimeter shots when the defense backed off.